After many of the Blackhawks’ top prospects travelled to Chicago for the annual prospect camp this past week, fans were able to get a look at what the future might hold at the United Center. Brandon Saad was the only player at the camp that appeared to be ready for the NHL. He finished his junior career with impressive regular and postseason numbers last year, and all indications are that he’s headed for the Blackhawks’ roster this fall. He did skate at center on the final scrimmage, but he’s a natural left wing. Teuvo Teravainen showed offensive creativity that stood out on a daily basis. In an organization that has drafted bigger players throughout the last three drafts, his Patrick Kane-like body was among the smallest in the camp. But he showed flashes of being something special throughout the camp, and tied for the camp lead with four points (two goals, two assists) in the three scrimmages. At only 17, the future might be bright for him, but not at the United Center any time soon; a reasonable ETA might be 2014. As you can see in the video, the organization continues to be very high on Adam Clendening. The fact that they mentioned his name, “NHL” and “this season” in the same breath adds further creedence to the school of thought that the Hawks are actively trying to move a defenseman on the NHL roster; there are eight defensemen battling for ice time already on the Blackhawks roster, so someone would have to leave for Clendening to get a shot. Is he ready? Not today. But he isn’t very far away, either. 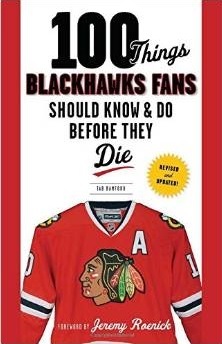 An appropriate ETA for him at the UC would be October 2013. Mark McNeill had three assists in the three games and played both center and wing. The Hawks’ other first round pick from 2011, Phillip Danault, looked very comfortable and smart on the ice as well. Danault looks like an ideal third-line center in the future, which asks two questions: Does Danault wait for Bolland’s contract to expire to get a shot? and How does Marcus Kruger, whose game is similar to Danault’s, fit into the Hawks’ future? Brandon Whitney, a seventh round pick this summer, allowed only one goal in 20 minutes of action during the camp. Unfortunately, his minutes were limited and he appeared in a walking boot at the end of the week for the photo of the 2012 Draft class. When he was on the ice, he looked good. But, again, he’s years away. Some other Hawks’ prospects that were impressive included forwards Kevin Hayes, Vince Hinostroza and Terry Broadhurst, defensemen Sam Jardine, Klas Dahlbeck and Joe Gleason, and goaltender Mac Carruth. There is a lot to like about the talent in the Hawks’ organization, and the future is certainly bright. Stan Bowman has added a lot of high-end talent to the organization’s depth in the last two drafts. The depth that has been added means prospects that have performed well in Rockford will feel pressure to perform as well. Having a deeper pool of prospects to work with also opens opportunities for Bowman to include younger players in deals to make the team better. I’d like it if they at least gave Saad a chance at the 2nd line center position. If it doesn’t work, no biggie, if it does, thats a big load off our backs. I also really like the Hayes brothers, I have a feeling they’re gonna make a huge impact, especially when they are on roster together. The future is definitely bright. the biggest disconnect seems to be Clendening! I did not see him at camp, but I have seen him on TV a few times… made alot of mistakes in Junior World Cup IMO. Looked like the second coming of Montador to me. Tab, help me out on another subject. I keep reading rumors about the Hawks trading for Lougano. Even trading Bolland for him. It’s like Bazzarro world. And can the Hawks be serious about committing 15% of cap space to gaoltending????? I’ll put it this way: the Blackhawks need NHL-ready depth at center. The rumor of Bolland for Luongo (at least in part) proposes that the Blackhawks would be trading from a position of weakness (for now) to improve a primary rival in the Western Conference. It also proposes that the Canucks would make a trade to improve one of their primary Western Conference opponents. So… I don’t see it as being very likely. The more I see, the more it feels like folks in Vancouver are trolling Chicago because they have nothing better to do this summer. @ wall – lots of mixed opinion on Clendening, absolutely. I wouldn’t necessarily put the WJC performance by the US completely on Saad, Clendening or any other individual player; they just didn’t show up as a team. There is a lot to like from Clendening and he played well in a strong college conference last year. The good news is the NHL roster is pretty full, so he’ll get time to develop as a professional. But, as you can see from both this video & other comments from the Blackhawks (and as I’ve been saying for months), the folks at the top of the organization REALLY like this kid. Saad at central are you serious? Bowman is trying to patch up another one of his failures of improving needs in the offseason with a rookie with a lot of potential! Ridiculous its hard enough as a 19 yr old rookie trying to make the big league let alone make the team in a position he’s never played and heard he’s horrible at the dot! Tallon atleast has the beanbags to sign and make trades why not sign Mueller to a one year 1.75 for a 20 goal scorer who’s decent at the dot I’m tired of looking at Bowman try too make excuses for his inability to make any moves besides over payment of sub par players! Rocky please open your eyes for fucks sake! I like the idea of the Hawks looking to Jonathan Bernier. Hopefully there is fire to go with this smoke! I was on the Tuukka Rask bandwagon and this would be equally as smart of a decision now that Rask is signed. Tallon gambled on Mueller!I personally wouldn’t have!Time will tell? 1 year 1.75 is hardly a gamble for a 20 goal scoring center when you’ve needed a center for a couple years now!